Thirty years ago in 1987, Paul Bocuse created what is considered to be the most prestigious cooking competition in the world. 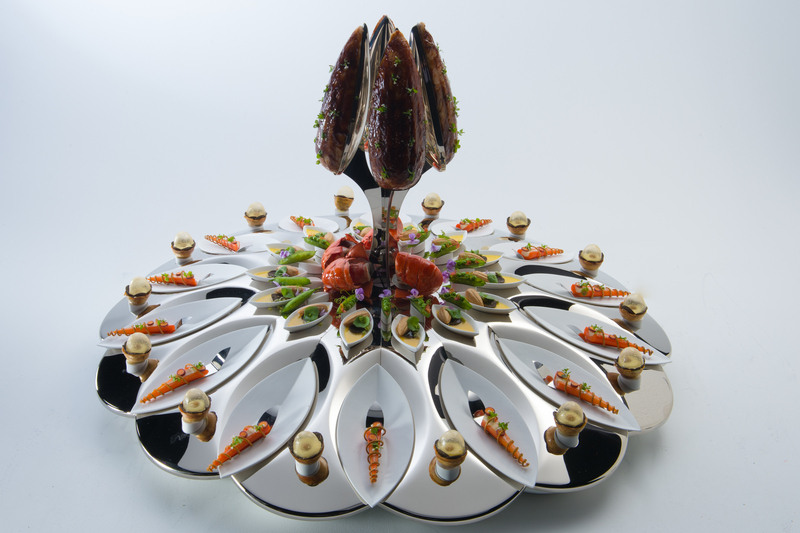 There are twenty-four countries that are fortunate to make it to participate in the grand finale of the Bocuse d’Or, which is at the heart of the Sirha trade exhibition. These young chefs are some of the most promising in the world and experiencing two days of intense competition. They had to first earn their qualifications via various continental events (Bocuse d’Or Europe, Bocuse d’Or Asia Pacific and Bocuse d’Or Latin America), individual qualifications, or attributed one of the wildcards. This assures the final test will be revealing the best talent culinary worldwide. Providing a little background on Bocuse d’Or is important to me, as Luxe Beat Magazine’s French Master Chef Advisor, Hervé Laurent, was responsible for introducing me to this event and finally convincing me to attend in 2009. I was hooked and amazed at the talent I saw. Somewhere around 2007, Paul Bocuse met with Thomas Keller and enlisted his help in getting American chefs involved. He felt there was so much talent that was untapped and could benefit in Bocuse d’Or. Keller agreed. In 2009 and 2011 when I attended with Hervé and Brenda Hill, I did quite a bit of interviewing and discovered which teams were doing how much preparing and practicing the year before the competition. Team USA was not up to most of the other countries placing sixth and certainly not up to the winners. They tried hard, but the passion and support was not there that has evolved. I personally believe the ment’or (inspiring Culinary Excellence) program has helped. However, that changed for 2015 when Team USA won the silver and it was exciting for Sherrie Wilkolaski and me to be watching with bated breath. And, needless to say, the crowd went wild in 2017 for the well-deserved fete. 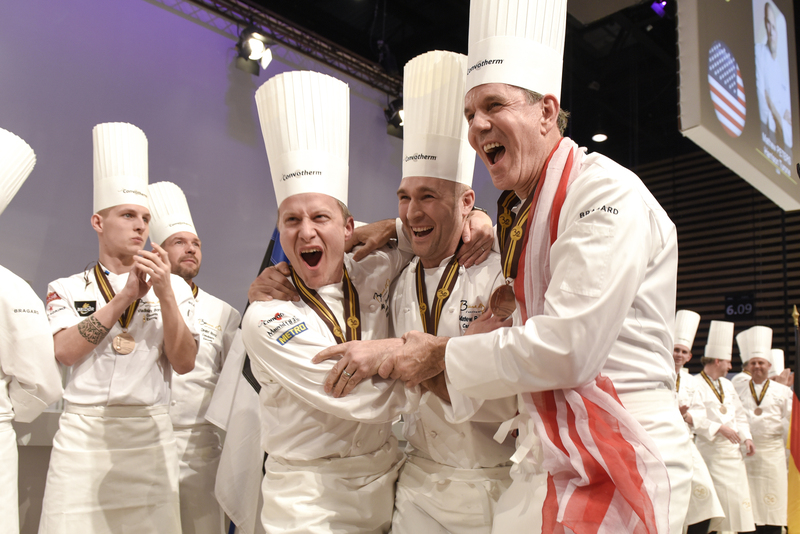 Bocuse d’Or is a Culinary Olympics and for 2017 Team USA got the Gold. It is a “Theme on a Tray.” Each chef has five hours and thirty-five minutes, not a second more to prepare a recipe that using the imposed main product. These products are presented “a la francaise” on a tray. A surprise was in store for 2017. 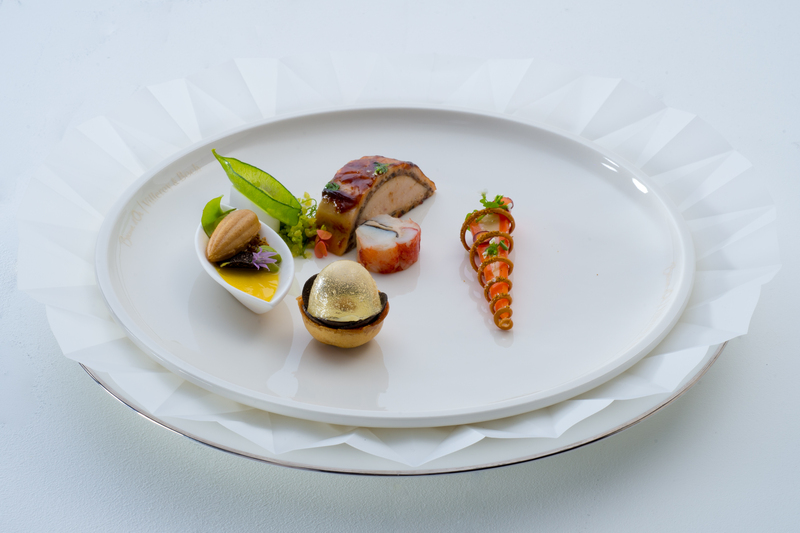 “As for the presentation on a tray, the Bocuse d’Or will proudly state its Lyon and French identity. 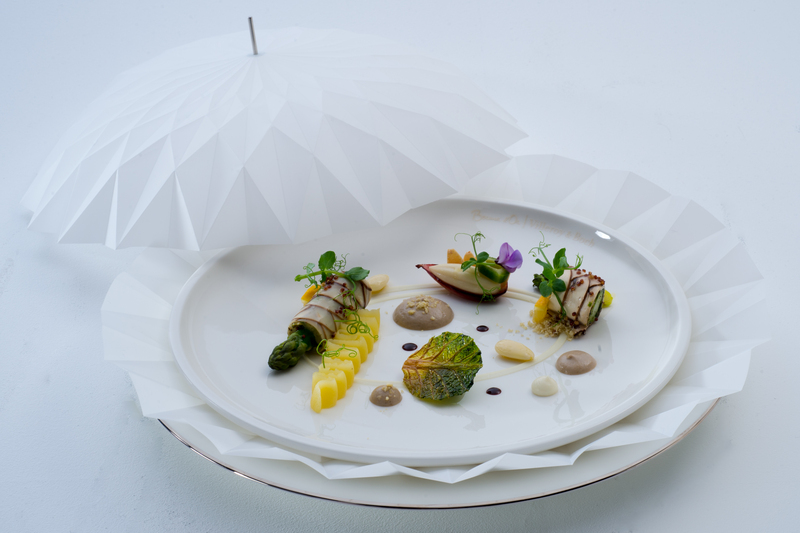 To celebrate its 30 years of xistence the participants will work with ‘Bresse chicken and shellfish’ based on an interpretation of the famous Lyon recipe for ‘Chicken and crayfish’. “For its 30th anniversary in keeping with its passionate and attentive quest to reflect modern cooking in line with its times, Bocuse d’Or places the emphasis on vegetal. For the dish on a plate participants in the 2017 grand finale will be required to prepare a creation that is 100% vegetal, composed exclusively of fruits, vegetables, cereals, seeds or legumes. United States now total 2 podiums. After Years of relentless quest, Team USA wins a well-deserved 1st place, after 2nd place reach in 2015. 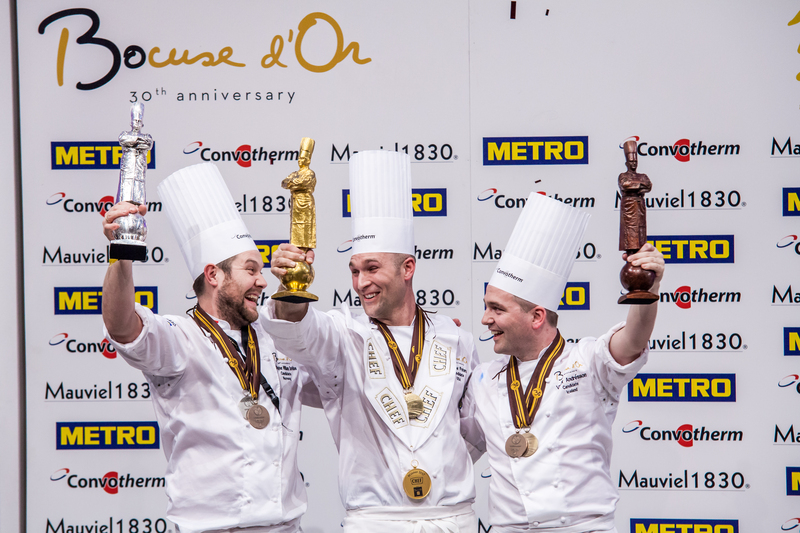 Norway now has a history of 10 podiums including 5 Bocuse d’Or. The country confirms in incredible regularity in the first places and takes once again its cuisine to the highest level on the international scene. Iceland now totals 2 podiums. Regularly placed in top of the ranking the country comes back on the podium after a 3rd place in 2001. This year was quite special. But all of the twenty-four teams that took part deserve congratulations for a job well done. They all prepare for over a year with time and passion and they need to have sponsors to back them. For many, it is a full time effort. This event happens every two years the end of January. Good chefs and those into fine dining are aware. But many Americans are not. Our cheering section is small compared to other countries. I encourage you to consider attending in 2019. The Sirha trade show is amazing, the International Catering Cup opens your eyes to what’s on the horizon, and the CMPasrisserie will have you drooling. It’s simply a week of bliss for everything someone in the hospitality and restaurant business could dream about and more than the consumer can begin to imagine. If you think the best of the best, with corporate chefs preparing from around the world and the products to produce and support, that barely scratches the surface. The Bocuse d’Or is the crowing event or the week or the showstopper, but there truly is something for everyone from demonstrations, café shows, food studio, new products areas, master class village, omnivore food studio, print food expo, sixime sens, village métiers, wine bar, etc. Again, congratulations Team USA, you earned the GOLD. NextSVATMA (Tanjavur): History Gets Hip in Tamil Nadu’s 1000-Year-Old Chola Capital!